EcoLogic scientists Kurt Jirka and Eileen Randall recently participated in a meeting on freshwater mussels of the St. Lawrence River region in northern New York. 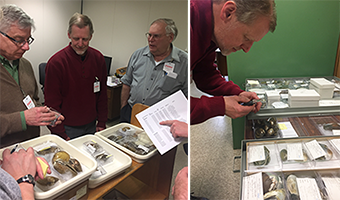 The event, hosted by the New York State Museum in Albany, was focused on the distribution of native mussel species, current genetic studies, mussel identification, and the future of freshwater mussel research and restoration in the region. Attendees included representatives from NYS Department of Environmental Conservation, the New York State Museum, the Saint Regis Mohawk Tribe, research institutions, and environmental consulting firms.